Slaughtneil stayed on course for a fourth successive Derry Senior Championship title with an ultimately comfortable victory over Glen in Celtic Park on Sunday. Game management is the fashionable term for the manner in which Slaughtneil have progressed through the championship in recent seasons and they were at it again on Sunday with Glen never carrying the goal threat they needed to really trouble the champions. Slaughtneil controlled the first half and the biggest surprise was the found themselves going into the break only one point ahead at 0-4 to 0-3. Master of game management, Slaughtneil established a 0-4 to 0-1 lead which could and should have been more emphatic and Glen will have been the happier of the two sides despite playing with the wind at their backs in the opening half hour. Twenty minutes in, Glen were still without a score, Danny Tallon eventually opening their account with a free after Chrissy McKaigue had fouled Emmet Bradley. By that time, Slaughtneil had doen exactly what Slaughtneil do with some tenacious tackling and patient build-up. The only things that was missing was the clinical efficiency in front of the posts. Christopher Bradley grabbed their first score on four minutes but spent the remainder of the half trying to detach Glen's Conor Carville from his shirt. The Watty ngraham's man was hardly subtle in his making of the Emmet's forward but it went unnoticed by referee Dan Mullan. Se McGuigan and a Paul Bradley free made it 0-03 to no score by the ninth minute but Slaughtneil failed to push on from there as many expected they would. The half's pivotal moment was a superb save from Callum Mullan-Young who brilliantly denied Shane McGuigan after Se had done superbly to win Chrissy McKaigue's high ball forward. Shane look set to score and give his side a seven point lead. Instead Mullan-Young was out to block and Glen took advantage to reel the champions in to a single point lead by half-time. An excellent Emmet Bradley '45' brought it back to two and in first half injury time, midfielder John McCamley charged through to tap over the bar and leave an unlikely 0-4 to 0-3 interval lead for Slaughtneil. Chrissy McKaigue took all 45 second half seconds to douse the flames of a Glen comeback with a lovely score from along the right hand touchline. It was cancelled out by a Cathal Mulholland score at the other end but a superb Paudie Cassidy catch from a Glen kick-out then set up Shane McGuigan for a lovely score. The two point advantage became three with a Paul Bradley free as Slaughtneil ominously edged 0-7 to 0-4 clear six minutes into the half. Glen had legitimate complaints on 43 minutes when the referee was too quick on the whistle, pulling play back for a free when had he let Glen go, McCamley was clear on the Slaughtneil goal. To compound Glen woes, Emmet Bradley was wide from the free. A Tallon free reduced the deficit to two but Paul Bradley responded in kind after Paudie Cassidy had been brought down as he charged through. Despite their dominance, the Emmet's had struggled to to take their lead past the three point mark at any point during the game but the finally put two scores when Frank McEldowney won possession on his own 45m line and a flowing move ended with Paul Bradley tapping over to leave it 0-9 to 0-5 with six minutes remaining. There was little doubt about the winner. glen had never looked like getting the goal which they needed. Instead, as Slaughtneil have done for the past tagged on points from Se McGuigan and an imperious effort from Patsy Bradley to secure a fifth successive appearance in the senior final. Slaughtneil: Anton McMullan, Paul McNeill, Brendan Rodgers, Karl McKaigue, Francis McEldowney, Chriss McKaigue (0-1), Keelan Feeney, Patsy Bradley (0-1), Paudie Cassidy, Ronan Bradley, Paul Bradley (0-4, 3f), Micheal McGrath, Shane McGuigan (0-2), Se McGuigan (0-2), Christopher Bradley (0-1). 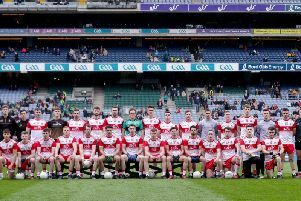 Glen: Callum Mullan-Young; Conor Gallagher, Phillip O'Connell, Conor Carville; Jack Doherty, Conor McDevitt, Cathal Mulholland (0-1); Ciaran McFaul, John McCamley (0-1); Michael Warnock; Emmet Bradley (0-2, 1f, 1 forty-five), Tiarnan Flanagan, Danny Tallon (0-2, 2f), Conor Convery, Paul Gunning.